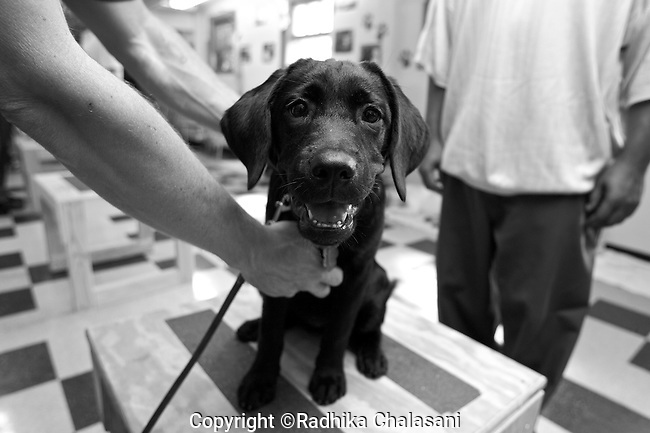 BEACON, NEW YORK: A prisoner tries to teach one of the newest recruits to the The Puppies Behind Bars program, a 4-month-old labrador retriever, to sit on command at Fishkill Correctional Facility. The Puppies Behind Bars (PPB) Program works with prison inmates in New York, New Jersey, and Connecticut to train service dogs, including ones who help injured soldiers. Prisoners are in class one day a week and then live with the puppies and train them on their own the rest of the week.